San Diego, CA, USA – San Diego was barely stirring when His Holiness the Dalai Lama set out this morning to visit the San Diego Zoo. He was welcomed at the gate by Mayor Kevin Faulconer, his wife and President of the Zoo Douglas Meyers. To begin with he was shown a short video outlining the important role the Zoo plays in conservation, both of species of animals and in some cases the plants on which they depend. His Holiness rode in an electric buggy round the park from which he viewed various birds and animals. He was shown a Malayan tiger, a leopard, a lion and a cheetah among the big cats. He saw elephants being washed down and heard that San Diego is the destination of all the elephants in the USA when they retire. The Zoo looks after some very elderly elephants. Amongst the birds he saw condors, a peacock and hornbill, as well as a flock of flamingos. At one stop an Australian koala and a baby python were brought to him. Elsewhere he saw giraffes and rhinoceroses. Back at reception His Holiness drank tea and talked about the Zoo’s work with the Mayor, the President, his staff and members of the board and returned to his hotel before the Zoo opened to the public. Meeting with about 200 members of the San Diego Indian community after lunch, His Holiness was welcomed and introduced by Dr Suresh Subramani. There followed a brief musical interlude as Prof Karthik Seshadri gave a short sitar recital. His Holiness outlined his three commitments—promoting basic human values as a source of happiness, encouraging inter-religious understanding and, although he has retired and devolved his political responsibilities for Tibet to an elected leadership, preserving Tibet’s religion and culture, as well as its natural environment. 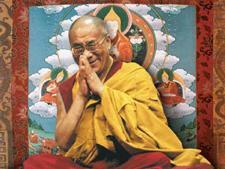 He explained that efforts to preserve Tibetan culture had begun in 1959, when he first came into exile. However, particularly after 1973, when he made his first visit to Europe, he began what have become extensive exchanges with modern scientists. He then started to appreciate that the ancient Indian knowledge of the workings of the mind and emotions could make a contribution to the well-being of humanity. A member of the audience acknowledged that most religious traditions have resorted to violence at sometime in their history, but he’d been surprised to learn about what have been referred to as Buddhist terrorists in Burma. His Holiness agreed and told him he had recommended that when Buddhists in Burma felt antagonistic towards others they should pause and recall the face of the Buddha. He added that although it was reported that monks had been involved in violence and persecution, if they had really behaved in such a way they could no longer be properly regarded as monks. He stressed that a terrorist is just a terrorist and that it is wrong to add a religious label, referring to Buddhist terrorists or Muslim terrorists, seeking to spoil the reputation of an entire religion. He explained to another questioner that the ancient Indian knowledge he had been referring to is contained in the more than 300 volumes of the Kangyur and Tengyur. Finally, an Indian woman thanked His Holiness for giving of himself all over the world. 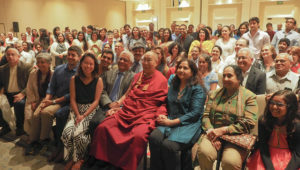 She asked if it would be acceptable if she requested her companions in the audience to join her in dedicating three recitations of the Gayatri mantra to his well-being. “During this short visit to this area, I’m happy to be able to meet with some of you who have a special karmic connection with me, not just in this life but over many lifetimes. Tibetans in Tibet and in exile have shown remarkable loyalty and dedication—I’d like to thank you. “We’ve been in exile for 58 years, which in the life of one individual is a long time. In Tibet temples and monasteries have been destroyed and many people have lost their lives. In terms of education, study of Tibetan language and culture are restricted in Tibet. Nevertheless, our Tibetan spirit remains strong and we are united—for which again I’d like to thank you. “It’s important that we keep our language alive, not out of attachment, but because it is the best means for accurately conveying Buddhist philosophy, science and psychology. Over the last 30 years or more we’ve held discussions with scholars and scientists most of whom are not religious as such. They are intrigued that the Nalanda tradition is based not on blind faith, but on reason and logic. “Whether you count yourself as a Buddhist or not, the study of logic is useful. In the past this was the province only of the monks, but these days the general public should be involved too. Haribadra wrote in his ‘Clear Meaning’ that those of dull faculties depend on faith, but those whose faculties are sharp depend on reason. If we follow the path of those with sharp faculties the prospects for the survival of our Buddhist tradition are bright. Remember that the Buddha advised his followers to accept what he’d taught not out of respect for him, but only after investigating and examining it as a goldsmith tests gold. Indian masters like Nagarjuna and Chandrakirti took this advice to heart and distinguished those scriptures that should be regarded as interpretable and those that could be regarded as definitive. “Buddhism has survived for more than 2500 years. If we can pass it on to the next generation it will be good and a source of benefit. “A few days ago I visited the Mayo Clinic for a check-up and the doctors gave me the all clear. They judge the prostate treatment I received last year to have been a success. Tomorrow, His Holiness will drive to Newport Beach.